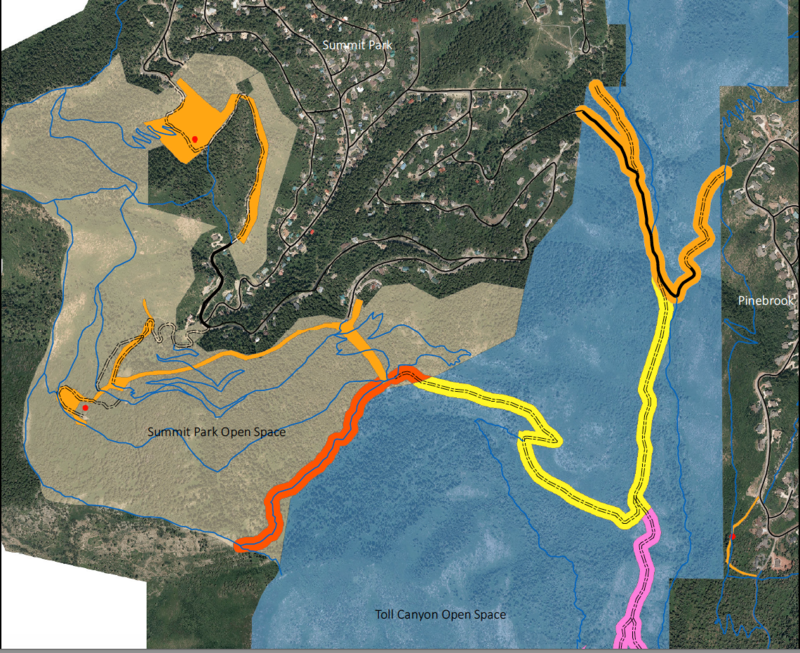 Basin Recreation’s Trails and Open Space is proud to announce another partnership with the Utah Department of Natural Resources Division of Forestry, Fire and State Lands (FFSL) to mitigate the risk and hazard of wildfire on Toll Canyon and Summit Park Open Space properties. The project, which is planned to begin, pending fire crew availability, Wednesday, September 13, 2017 will treat an 80-ft corridor of forested open space along the dirt jeep road route (known as the Hoof-it Trail) between Summit Park and Toll Canyon, then continue up the ridge (along the Over Easy Trail to Summit Slam). The FFSL Hot Shot Fire Crews will work throughout the month of September and October, clearing brush and hazardous trees. This project has been fully funded by a FFSL Summit Fire Mitigation Grant. This project will create a continuous break from Pinebrook to Summit Park by connecting the fuel reduction zone created in summer 2017 within lower Toll Canyon and previous control areas in 2006-07. The “Firewise” buffer created by this project will also serve to reduce the volume of surrounding forest vegetation (fuels) that present a hazard to nearby homeowners, while providing a safe route for emergency personnel to attack fire in the case of a catastrophic event. FFSL crews will also remove beetle killed trees and thin dense growing conifers to improve forest health and enhance wildlife habitat in the area. A chipper will be utilized to dispose of the debris and redistribute the residue on the forest floor for recycling. Firewood rounds will be stacked on the road for a community collection, scheduled for later fall. Why thin the forest? CLICK HERE to understand why. In the interest of public safety, users of Hoof-it in Toll Canyon and Over Easy to Summit Slam in Summit Park are advised to avoid the area when crews are actively working. Crews will be working in the area from 6am to 6pm Monday through Friday. The project is projected to be completed in spring 2018. The project will be coordinated by FFSL Area Forester, PJ Abraham, FFSL WUI Coordinator, Ken Ludwig and Basin Recreation Open Space Management Supervisor, Jessica Kirby. Questions about the project should be directed to jessica@basinrecreation.org. Those interested in firewood collection should click HERE to be placed on the request list. A special thank you to Utah Forestry Fire and State Lands for securing grant funding and providing crews to complete this project. This contribution to enhancing public safety is appreciated by the entire community! You can view the area map below or click HERE for the PDF.